The good people of Dundalk hope to succeed where Winnipeg, Montréal, Ottawa, Dublin, Belfast and many other communities failed. In each of these location, the Trial of Pádraig Pearse was condemned as having rigged juries, with either prosecution or defence calling for retrials. 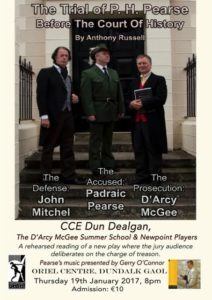 CCE Dún Dealgan branch, in association with Newpoint Players and The Thomas D’Arcy McGee Summer School, is staging a rehearsed reading of Anthony Russell’s new play The Trial of Pádraig Pearse in Oriel Centre Dundalk Gaol, Carrick Road, Dundalk, on Thursday 19th January. It examines the case for and against Pearse proceeding with the Easter rising. and Founding Father of Canadian Confederation, who will suggest the 1916 Rising was undemocratic and unnecessary. The tension between the acerbic prosecutor and the loquacious defender makes for riveting drama, interspersed by comic and ironic relief. Pádraig Pearse was found innocent of charges of treason against the Irish people at a special sitting of the Carlingford Assizes in Carlingford at the Thomas D’Arcy McGee Summer School in Carlingford, Co Louth in August. The majority innocent verdict of 33 to 28 (the narrow margin raising eyebrows in some quarters) found defence lawyer John Mitchel’s persuasive arguments to outweigh those of prosecutor Thomas D’Arcy McGee. D’Arcy McGee is adamant that the jury was rigged and has lodged an appeal with the Supreme Court of History for a retrial. The good people of Dundalk have offered to stage the Trial there on Thursday 19th January. Other communities in Winnipeg, Montréal, Ottawa, Newry, Armagh, Omeath, Belfast and Dublin have previously enlisted a balanced jury for a retrial but McGee keeps finding new grounds for appeal. A superbly engaging dimension to the play sees the audience debate the issues in the play as jurors in the jury room. This facilitates a participative role for the audience enabling them to deliberate on the issues as presented by prosecution and defence, as well as voting on the final outcome. The musical dimension to the theme, based around the motif of Óro Se do Bheatha Bhaile (verses of which Pearse wrote, and which he reputedly whistled on his way to the stonebreakers’ yard) will be provided by Gerry O’Connor, fiddle player with the Irish Rovers. A session of traditional music and song associated with the period will be held after the play.